Yes, Yes. I know, I hurt my back in tae kwon do in early April and I need to rest. I am resting, I promise. I haven’t taken class in nearly a month and a half and I’ve promised my doctors I’m taking all of June off, too. But, does that mean I’m just going to lay around? Me? Not a shot. And, in my newly found hours, I also finished off the sequel to FLYING TO THE LIGHT, planted our garden (veggies and tons of flowers) and spent evenings with my kids just playing games. Now, truth be told, the first few weeks after my injury, I really didn’t do too much more than lurch around my house. Sciatic pain has a way of making sure you don’t forget that you need to heal. But, true to my own character, once I start feeling better, I’m off. As my chiropractor said, “just because you feel better, doesn’t mean you ARE better.” Now, that is true, but I try sometimes not to let my body rule and instead let my brain and heart rule. I just don’t want to give in to the pain. Am I stubborn? Maybe. Ok, I am. But, I think it’s more that I don’t want to miss any part of life and I just have too much to do to let pain get in the way of things. The problem is, I’m starting to feel a lot better. A lot. I’m itchy to start doing things again and be running around. My husband is telling me to slow down and while the four pounds I gained the past seven weeks isn’t a ridiculous amount, I have been eating a lot (and, shudder, drinking soda) and basically stuffing my annoyance down with carbs, lactose free icecream and tons of sushi. My skinny jeans are tight on me and that’s NOT good – so I’m dying to get back to working out. One more month, maybe two…. sigh… I wonder what else I can throw in there to do in the meantime? I’ll take suggestions – fire away! Continuing my love of interviewing authors, this week I’d like to introduce everyone to Sherry Foley. 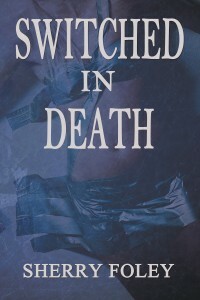 She’s a romantic suspense writer who just published her first novel in February, 2012 called SWITCHED IN DEATH, with Winter Goose Publishing. Hailing all the way from Missouri, I give you Sherry! Elyse: Please tell us about your book and what makes your novel different than others in your genre? Sherry: Switched in Death is about a serial killer who was brutally made fun of and bullied as a child. Now grown, the scars are still there. They retaliate in a unique way. The mind, after all, can convince anyone they are justified in their actions. Elyse: How did you come up with the idea for this book? Sherry: I remember at a very young age watching the news and seeing the stories about Charles Manson. I was in awe of how he felt justified in his killing of another human being. I’ve been equally intrigued by how fascinated people are with serial killers. Why is that? Manson has a Facebook with almost ten thousand followers! I researched serial killers and fused some details into my story along with the bullying idea. Elyse: So you use research a lot. Does that mean you plot a lot or do you let your story surprise you? Sherry: I always let my story surprise me. I’m a total panster. Elyse: Panster! What is that? I love that word. Sherry: It’s someone who doesn’t plot, outline or storyboard-they just fly by the seat of their pants and make it up as they go along. Panster. I don’t like to know what happens before it does. Elyse: So you like to be surprised – that’s great. So tell me, what are your current projects? Sherry: I’m working on a detective series that I’m quite excited about. I’m on the first book in the series. Its location is in my hometown of Springfield, Missouri. There are a lot of underground tunnels which run all beneath the town and as a kid I played in some of those. I’ve also named streets my best friends live on and places to eat where we hung out. There was a murder that happened there when I was a kid and it has bothered me my whole life. This first story will have elements of it, but it will end very differently, I can promise you that. Elyse: I heard your book, SWITCHED IN DEATH, was the topic of a few book clubs you went to – can you tell us about that experience – what was it like to hear them talking about your book and how did it make you feel? Sherry: Incredible. I mean, I know my characters are real, but I didn’t know anyone else did. Ha! I marveled at how the readers spoke about my characters, cared about them, and even quoted lines from the book. They were totally into it. They have all friended me on Facebook and kept up with my career. One club did an article on me for their town’s newspaper, both donated my book to their local library, and one had my book listed on the high school reading counts list! I didn’t want this to be a rant about the trials and tribulations of traveling on a business trip, but I just came back from a few days in Florida, where I stayed in two separate hotels, and there were just so many ridiculous issues that I felt the need to post. So much time is spent on professionals getting paid to figure out how to make a visitors stay “pleasurable.” Well, how about we then start with pet peeve #1. #1 ONGOING CONSTRUCTION ON A HOTEL SHOULD BE NOTED WHEN YOU MAKE YOUR RESERVATION! I was staying at a hotel in Miami one night and major renovations were occuring. In order to get into the hotel, you had to walk a very long way around the facility, up and down various stairs with your luggage, only to get to a small door that was heavy glass and you had to “pull out” to get your luggage in. The room itself I stayed in was at the other end of the complex, through hallways and other glass doors. No one was there to help or assist visitors and I can’t tell you how many times I got stuck in the door jams trying to juggle my laptop, a big purse and a large suitcase filled to the brim with sales materials. #2 INTERNET ACCESS SHOULD BE FREE IN YOUR ROOMS. One hotel gave it to me for free, the other wanted to charge me $12. TWELVE DOLLARS? I made a big stink at the front desk that this is ridiculous and should be free. They just stared at me like I had two heads and told me to use the communal business room, which I did. But, darned if they didn’t put a time limit on it. In the middle of one email the computer shut off and I had to sign back on and start all over again. Seriously. #4 OUTLETS AND AC/HEAT SWITCHES SHOULD BE ACCESSIBLE AND EASY TO FIND. When I got into the second room it was as if I had walked into a freezer. I must have spent ten minutes looking for the AC switch, which was hidden behind this “unit” which had a cover that had to be removed. In Florida they jack up the AC so high that when you walk into the room you’re afraid to change your clothes lest you get frostbite. #6 STARBUCKS. Ok, this isn’t really a rant because it’s not anyone’s fault, but for this NY City girl, an accessible Starbucks is a must. I just can’t do Duncan Donuts or regular hotel coffee because with my lactose intolerance, I need soy milk. In this day and age, outside NY, everyone still looks at me askance if I request soy milk or a non-dairy creamer for my coffee. So, I think each hotel should have a listing and set of directions to the nearest Starbucks who accommodates me brilliantly. Things I couldn’t complain about: Smoking (no one was smoking in the hotels at all, nice), free breakfast (one hotel had free breakfast, nice), water and snacks were available in both rooms for free when I checked in. That was very nice and surprising. Ok, I’m done ranting for the moment. Do you have any big pet peeves when you travel?